Cable gland, supplied with lock ring / nut. IP68 weatherproof rating. 6-12mm cable diameter. 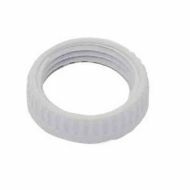 Plastic lockring for 20mm conduit accessories. 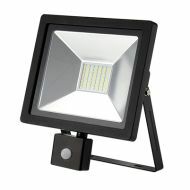 A rated energy saving 10W LED floodlight. 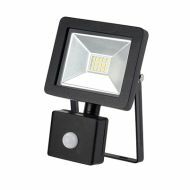 Lighting photocell, senses light level and switches on lights at dusk and off again at dawn. Plastic box 80mm x 80mm x 40mm WITH GLANDS. 6 cable entry points, IP44, snap on lid. 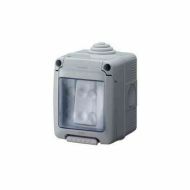 1g 13A outdoor switched socket with sealed lid which maintains IP integrity when socket is in use. 2g 13A outdoor switched socket with sealed lid which maintains IP integrity when socket is in use. 1 gang 2 way outdoor light switch. Approx 80mm high, 65mm wide, 65mm deep. 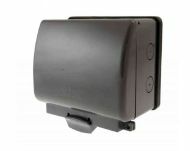 2 gang 2 way outdoor light switch. Approx 80mm high, 65mm wide, 65mm deep.